Joseph has performed in, and written and produced numerous original choreo-dramas with dancers; including dancers from the Atlanta Ballet... (choreographed dance performances that tell a story, with some pieces based on his lyrics). He has received commissions to compose and record music scores for theatrical drama performances and dance companies. While residing in Atlanta, Leone also produced multi-media stage productions with world musicians and his video art projections, as stage sets. Jeremiah's love for playing improvisational music is an integral part of his musical journey. While he always enjoyed creating his own music growing up, he began formally studying "jazz" guitar as a teenager, performing in jazz combos and big bands through college, and earning a minor in jazz guitar from Mercer University. The expressive freedom within that "genre" inspired him to constantly seek new textures and sounds with which to create. Since college he has begun performing on other stringed instruments including ukulele, banjo, sitar, and oud. Embracing multiple musical instruments and influences has led Jeremy to perform with a wide range of musicians and styles including The Freedom Jazz Quartet, The People's Republic of Funk, The Hot Club of Athens, Grogus, Free Monk Trio, Cult of Riggonia, Chamber Chanchers, The Whitehall Jazz Collective, and now Gypsy at Heart. Louis Romanos studied percussion under Idris Muhammad, Johnny Vidacovich and Art Perretta. At nineteen he moved from Connecticut to go to the birthplace of Jazz, New Orleans, to study music and philosophy. Louis has since performed and recorded with a number of renowned musicians including Tommy James (Director of the Duke Ellington Orchestra), Gene Bertoncini, Steve Masakowski, Chuck Leavell, Keith Richards, John Mayer, Charles and Cyril Neville, Al Hirt, Dave Easley of Brian Blade’s Fellowship Band, Charlie Miller of Dr. John’s band, Jazz Legend Earl Turbinton, Tricia Boutte, Marva Wright and Dave Anderson of the Louisiana Philharmonic and many, many more. As a Composer, Louis writes for live bands, dance, TV, video games, indie movies and commercials. Louis’s commissioned works include 5 works for the Confederacy of Dances performance in New Orleans at the Contemporary Arts Center, Take Me There, for the University of Monroe guitar ensemble and a piece for Mirari Brass Quintet. Louis wrote Light Waves for visual artist and Chicago producer, Nancy Bechtol, and together they have a work on Culture T.V. Louis also composed about a dozen pieces for C-E-N-T-E-R, a collaborative project between visual artists and composers, in Los Angeles, California. Additionally, his composition, Tyco at the Gates was licensed to the major motion picture, Cool It. Rohit Bhat is an accomplished tabla player in the Hindustani classical music. He started his training at the age of 10 under the guidance of Shre mudaballi Raja Saheb. Currently he is under the guidance of the eminent tabla maestro shree Prithwiraj Bhattacharyaji as a senior disciple. He has been performing nationally and internationally in prestigious concerts. Rob Sutherland began studying cello at age 8 in the New Orleans public school system and continued his studies through college at UGA under Dr. David Starkweather. He performed with the Oxford University Orchestra and Oxford Philharmonia as well as several chamber groups while studying Molecular Ecology for his PhD. Rob now owns Good Dirt Clay Studio with his wife Jessica and teaches both ceramics and music lessons in Athens, GA. Rob also plays and builds mandolins in his free time. Jeff Lidke is Professor of Religious Studies in the Department of Religion and Philosophy at Berry College where he has taught courses on World and Asian religions since 2003. His background in music began as a teenager with classical piano training. In college he did a study abroad in Nepal and there began studying the Indian percussion instrument, Tabla, with his teacher Homnath Upadhyaya. 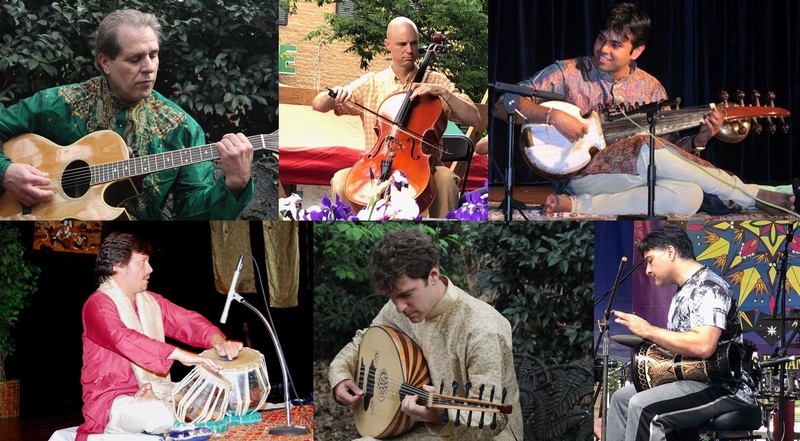 Over the last 20 years he has played with a number of world fusion groups, including Dreamtime Continuum, Devidasa, Blue Spirit Wheel and, most recently, Gypsy At Heart.